U.S. schools are starting to take advantage of the cost-saving and environmentally friendly applications of solar energy. Southern California's San Dieguito Union High School District and Irving Independent School District in Texas are both pioneering a new era in educational institution development. The school district has announced the completion of a 2 MW solar project developed by Chevron Energy Solutions. The project is currently providing two schools--Canyon Crest Academy and La Costa Canyon High School--with 70 percent of their electricity needs. The solar initiative is reducing the school district's carbon emissions by approximately 2,200 metric tons and will save the district $10 million over its operating life. The project cost was subsidized with $4.7 million from the California Solar Initiative. "Our mission is to provide a world class education for all students through quality programs that engage students and inspire achievement," said Ken Noah, superintendent of San Dieguito Union High School District. "The savings from this solar project will help us meet our goals." Irving Independent School District and GridPoint Inc.
GridPoint Solar Inc. was selected by Irving Independent School District to install a 582 kW solar system on Lady Bird Johnson Middle School. 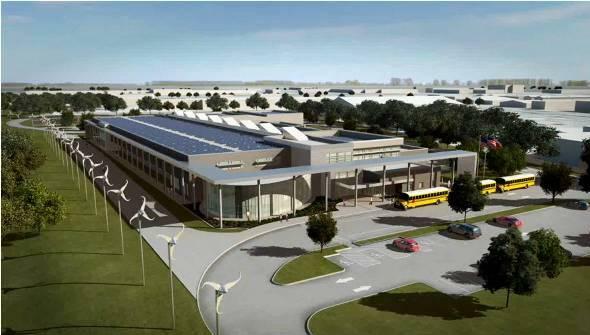 The school is to be the largest net zero-energy school in the United States, producing as much energy as it consumes. "The zero-energy school will reinforce teaching and learning as it becomes an extended classroom. With the use of efficient materials and cutting-edge renewable energy technology, the building transforms into a three-dimensional learning space," states Scott Layne, assistant superintendent for support services. "Every aspect of Lady Bird Johnson Middle School is an opportunity for its students to learn firsthand the value of renewable energy and energy conservation," said Jeff Ross, senior vice president of GridPoint. Sources: Chevron Energy Solutions and GridPoint Inc.